Serious about getting "down to business" in your Christian walk? 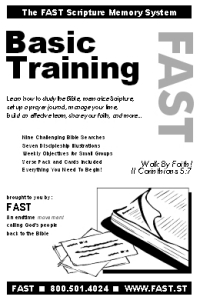 Check out Basic Training - the program that launched our ministry at FAST! This program gives you the practical tools you need to live out God's Word effectively, as a disciple of Christ. In addition to reviewing the basic principles of Scripture memory, this course covers such areas as how to study the Bible, how to set up a prayer journal, and how to manage your time. Also included is training on team building, personal witnessing, and spiritual multiplication - and more!